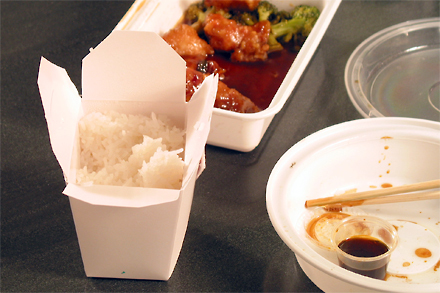 I’m sure we’ve all faced the same dilemma, as I often encounter, of what to do with Chinese takeout leftover rice. Do we save it or throw it out? I’m always reminded of starving children in China whenever I tip the classic paper carton over the garbage pail, before hastily reversing my action. Invariably I would clasp the top of the rice container back together and put it in the refrigerator. Very soon I would discover that the rice container had multiplied and there will be three or four of them to reckon with. For years I’d use the leftover rice by reheating in steamer, and later in a microwave oven. But reheated rice is never satisfying. It becomes dry and lacks the fluffiness of freshly cooked version. However, making fried rice from leftover rice is the perfect remedy. In fact legend has it that fried rice was invented by a restaurant’s creative use for their abundance of leftover rice. To me using leftover rice for fried rice is absolutely essential. I often make a pot of rice a day in advance in anticipation of frying it the next day. Leftover rice actually results in a much more flavorful fried rice. The dryness in leftover rice better absorbs the flavor from any added ingredients. It also creates a dish with discrete kernels of rice, which I like, rather than mushy mess. I love shrimps in fried rice. They provide a nice succulent texture to the dish. Two common varieties of fried rice I really like are shrimp fried rice (蝦球炒飯) and Yangzhou fried rice (揚州炒飯), which contains roasted pork and shrimps. 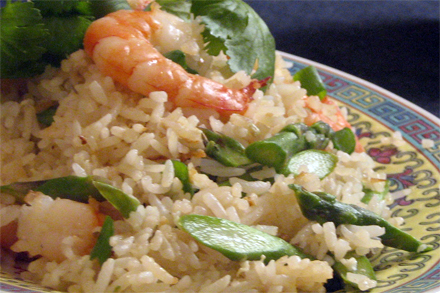 Today I’m offering you my favorite shrimp fried rice recipe. I use both fresh and dried shrimps in this recipe. Adding dried shrimps increases the flavor intensity of fresh shrimps. In fact you can make the same recipe with only dried shrimps. I’ve received rave responses from both versions. 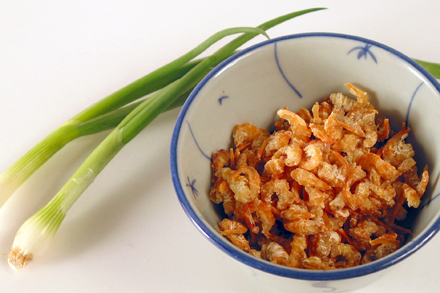 Rehydrate the dried shrimp with about 1/4 cup cold water for about 20 minutes. In the mean time peel and devein the fresh shrimps, chop the garlic, and cut the asparagus and scallion. Separate the egg white and set aside. Drain the dried shrimps and set aside. To finish the dish heat the vegetable oil in a very hot wok until it is just beginning to smoke. Add the garlic and dried shrimps together and stir-fry till brown and crisp, about 3 minutes. Put the fresh shrimp and continue to stir-fry for another 3 minutes or so. The fresh shrimps should now be partially cooked. Put the asparagus and the leftover rice together into the shrimps. Break up any lumps of rice and continue to stir-fry for another 5 minutes or so. Salt and pepper the dish during this time. Then push the rice towards one side of the wok to expose about a quarter of the bottom. Pour the egg white into the open space in the wok and scramble slightly. Then push the rice over the egg white and continue to cook. At this stage you would want to stop stirring the rice and let the bottom of the rice brown slightly to provide the characteristic burnt flavor. Stir the rice again after each pause to create even browning. Pause and brown the rice twice and you are ready to serve. Just before plating put the chopped scallion and mix well. If you wish to make a version without fresh shrimps you can just omit it and add another extra oz. of dried shrimps. I just want to shout out to other moms like me that this is a great, wholesome and comforting dish that take almost zero time to make and my VERY picky daughter will wolf it down. Thanks for sharing recipes that moms can get on the table and actually enjoy! P.S. To anyone reading this comment- try this recipe and you’ll never be able to go back to take-out fried rice! It’s filling but not overly greasy. Red, this comment is not related to this post, but I really need to know how Asian cooks make their broth. What’s the secret? Bev, That is a great question. There are in fact a few different types stock used in Chinese cooking. I am planning a post that will discuss stocks. A quick answer to your question though is that bones and ginger are the key ingredients in Chinese stocks. Note that Japanese stocks are very different from Chinese stock. Japanese stock is mainly based on dried bonito fish, konbu (seaweed) and other aromatics. Thank you Kian! I think most of us have that same inner feeling of waste not want not. For me it is the stories I had heard of having nothing but potatoes to eat during the war…..finish everything on your plate. I can’t wait to make this dish for my family! PS: I usually make FR with a Mandarin recipe I got while living in CA. I think we’ll like yours even better. Going to try yours tonight, maybe just meatless. You can make fried rice with pretty much any protein. Use the basic of this recipe to make variations. Always use chopped garlic, leftover rice, scallion and eggs. For variations I enjoy chicken, Chinese sausage, bbq pork, or even dired salted fish. You can also make vegetarian fried rice with baby corn, mushrooms, bamboo shoots, carrots, celery and/or onions. I would not advise using leafy vegetables however. They then to moisten the rice too much. My SO so loves his greens (must be because he is from New Orleans)…I steam them briefly, shred and add to HIS plate of fried rice just before I serve.